Granada is a medium-sized Spanish city with fewer than half a million inhabitants. Though in terms of sheer number of sights, it doesn't seem to have so much to offer, when you consider how you long you will spend doing them, you'll realize that a day in Granada is never enough. Most of Granada's attractions are enjoyable throughout the year, but make sure you see the Alhambra on a sunny day, as it is nowhere near as impressive when it is cloudy (as I discovered). In November it's the Jazz Festival, which is worth a trip. If possible, stay for at least two days. But the tapas might make you want to stay and you could easily waste half a day relaxing in a Moroccan tea room, in which case you'd need longer. But I Only Have One Day! If you're visiting Granada on a day trip from Malaga or from Seville, you'll just have time to do see the Alhambra and try the local tapas. Granada still serves its tapas like they were supposed to be served - free of charge, one for each drink you buy. You never know what you're going to get, so either bar hop by yourself and take your chances, or take a professional guided tour (see link below). The Alhambra was one of the candidates for the New Seven Wonders of the World. It is a grand Moorish fortress, with beautiful gardens and spectacular architecture. With limited tickets issued each day, be prepared to stand in line for a long time. Alternatively, book this Alhambra Guided Tour which allows you to skip the line and gets you guaranteed entry (as well as an expert guide to show you around. 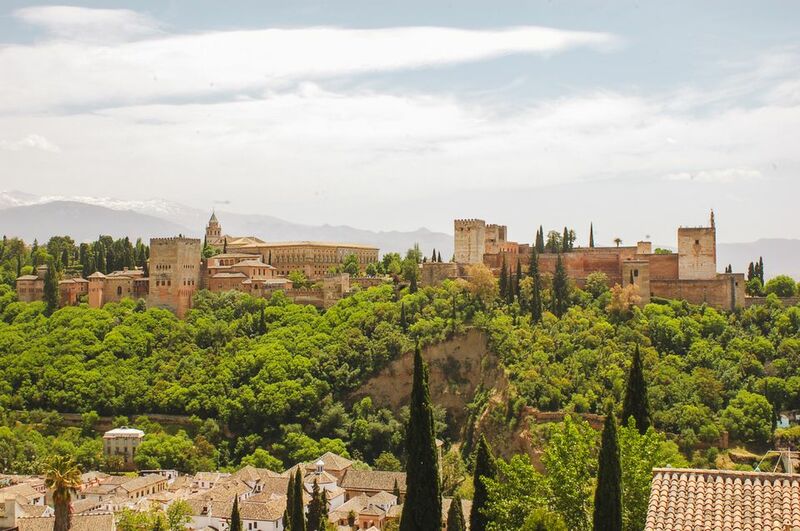 If you want to combine your Alhambra tour with something else (such as a flight over the grounds or a visit to an Arabic bath) or you are visiting from another city, check out some other Alhambra tours. With more time in the city, you should stretch your legs and explore what else the city and surrounding area offers. The Albayzín (or Albaicín) is Granada's Moorish district, full of winding streets and steep gradients. Overlooking the Alhambra, Sacromonte is Granada's gypsy quarter and is famous for its flamenco venues. These two areas of Granada couldn't be more different and are the most beautiful places to get lost in. The mountainous Alpujarras with some of the most beautiful villages and best jamón in Spain, the cave houses of Guadix, the Sierra Nevada, Antequera and the natural hot springs in Santa Fé (which is actually more commonly a night trip than a journey taken in the daytime). Cordoba is a similar distance away, but you're better off going via Seville. Granada is a popular day trip from Malaga, but few visit Malaga from Granada (there isn't much to see). See also: . If you're on a cruise to Motril, it's possible to do a .
Seville and Cordoba are the other two must-see cities in Andalusia (no, Malaga is not a must-see city). How to Get to Seville Bus and train both take the same amount of time and cost about the same (20-25 euros and three hours). You'll never get to see everything Seville has to offer in a day, but don't miss the city out if that's all the time you have. Bear in mind that the six hours on a bus or train (plus getting to and from the train stations), which will eat a lot into the time you have in the city. Consider a Guided Tour of Seville (departing from Granada), which leaves very early in the morning to pack as much in as possible (but at least you can sleep on the bus!). The hotel pick-up and convenience of the bus dropping you off at all the sights will save you a lot of time. I'd estimate you would get nearly double the sightseeing time on a tour than by traveling by yourself. If you'd like a little more time in Seville, check out this Two-Day Trip to Seville from Granada. Cordoba is home to what was once the biggest mosque in the world, as well as a famous Jewish quarter and an old town that feels more like a village than a major city. A day is enough time in Cordoba. How to Get to Cordoba It takes around three hours by both bus and train to get from Granada to Cordoba but the bus is a lot cheaper. However, it makes much more sense to visit Cordoba from Seville, which is connected to the city by the high-speed AVE train (it takes just 45 minutes!). All the more reason to not visit Seville as a day trip but to stay there for a few days and make day trips from there. Another option is to take a Three-Day Andalusia Tour from Granada with guided tours of Seville, Cordoba, and Granada, starting from Granada itself. The tour includes a flamenco show in Seville, a tour of the Mezquita in Cordoba and the Alhambra in Granada. Skiing in the winter, hiking in the summer, the Sierra Nevada has some impressive peaks and the southern-most ski resort in Europe. Tour of the snowy mountain range close to Granada. See all kinds of amazing fauna among spectacular mountains, of the kind you'd never expect to see in southern Spain. Public transport in the mountains is difficult - you'll need to hire a car or take a tour. With less pointy mountains but equally captivating is the Alpujarras mountain range, immediately to the south of the Sierra Nevada. Beautiful gorges, lush vegetation and natural springs that can be enjoyed in a day but would need a month to explore fully. Ham and wine are made in this area. Public transport to Nerja and the coast in general is quite poor, so unless you are hiring a car, this is perhaps the best way for you to see the region. Caves and beautiful coastline greet you south of Granada. Public transport to Nerja and the coast in general is quite poor, so unless you are hiring a car, I recommend taking this Guided Tour of Nerja from Granada. Even closer is the beach town of Motril, which takes under two hours by Alsina Graells bus. Scenes from HBO's hit TV series Game of Thrones are filmed in Osuna, so check out what Dorne and Meereen looks like in reality. Ancient Dolmens, bizarre rocks formations, and a lovely town puts Antequera high on the must-see list. With more than half the population of Gaudix living in caves, the town is a curiosity worthy of a visit. Alsina Graells runs the bus service from Granada to Guadix - journey takes 1h15 and costs 4.50€. Jaen is the olive-growing capital of Spain and a vibrant university town. The Alsina Graells bus company goes to Jaen - the journey takes between one and one-and-a-half hours and costs under 7€. The bus timetable from Granada airport has changed in recent times and many websites on the subject are now out of date. Buses departures are timed to coincide with flight arrivals and departures. If you are arriving, the bus will be waiting outside, if you flying out of Granada, check at the tourist information center (in Plaza Nueva) for details of when the buses depart. A taxi costs under 20€. Where is it? Located in the city center on Avenida de Andaluces, around 20 minutes walk' from Plaza Nueva. For Travel to: Since it is Granada's only train station, all train routes from Granada start here. Direct routes from Granada include: Barcelona, Seville, Algeciras, Almería, Cadiz, Córdoba, Ciudad Real, Girona, Guadix, Jerez De La Frontera, Lleida, Madrid, Ronda, Segovia, Tarragona, Toledo, Valencia, Valladolid, and Zaragoza. When Should You Take the Train to Granada? Barcelona to Granada Really, you're better off flying, but if you don't want to, the train takes half the time of the bus. Ronda to Granada There is no bus between these two cities. Seville to Granada There is little difference in travel time or price for this journey, so take the train - it's more comfortable and the station is more central. Valencia to Granada This is an awkward journey however you do it, but the train is better in any case. Where is it? 3km outside the city at Carretera de Jaen, s/n18014. You can get to the bus station from the center of Granada Granada in Granada city bus number 3 and 33, and from the Palace of Sports in the city bus number 10. For Travel to: Being the only bus station in the city, all bus routes from Granada originate here. Popular national destinations include Barcelona, Madrid, Bilbao, Malaga, Valencia, Seville, Marbella, Alicante and more. There are also international routes including destinations to France and Morocco. When Should You Take the Bus to Granada? Cordoba to Granada Again, the bus is cheaper but doesn't really take any longer than the train. Malaga to Granada There is no train between these two cities. Explore the rest of Andalucia – Cordoba isn’t far, or Seville. After that, north to Madrid, or north-east to Valencia. If you intend on heading to Barcelona, go via Madrid or Valencia. From Madrid 422km - 4h20 by car, 6h by train, 5h45 by bus, 1h flight. From Barcelona 915km - 9h by car, 12h by train, 15hrs by bus, 1h20 flight.